Oooh loving Sarah Hilary‘s writing! In fact I loved this book so much that I immediately read No Other Darkness straight afterwards! Marnie Rome’s character is strong, she brings feistiness and inspiration to this sad tale centring around the lives of women in a refuge. All of the women are in the refuge for different reasons and each have their own demons and secrets. Someone Else’s Skin lifts the lid on this private world and offers many different view points while Marnie and her colleagues attempt to solve the case. Loved the bit with the radio, very satisfying! Synopsis: Winner of the Theakston’s 2015 Crime Novel of the Year, and a 2014 Richard and Judy Book Club pick. 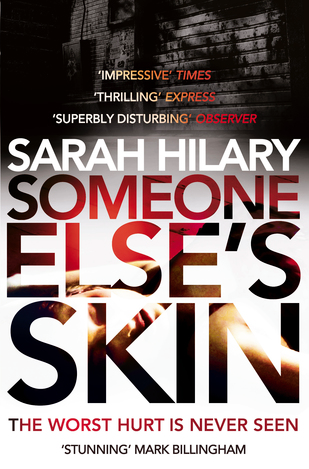 Devastating and brilliant, Sarah Hilary’s SOMEONE ELSE’S SKIN has been acclaimed as ‘stunning’ by Mark Billingham and ‘superbly disturbing’ by the Observer. Called to a woman’s refuge to take a routine witness statement, DI Marnie Rome instead walks in on an attempted murder. Trying to uncover the truth from layers of secrets, Marnie finds herself confronting her own demons.